So I decided to give myself a crash-course in using Adobe Flash and Final Cut Pro to create a video that turned out, well, not so great (the resolution stinks). But it’s my first time using those programs and I was in a hurry to actually complete something before the morning. Well, it’s almost 8 am and I’ve been up all night, so I probably spent too much time on this stuff. In any case, Plain Joe Studios sent me on a bluesky to Gateway Church in Arizona to help create a new spatial story for their children’s ministry environment. I was there several days, and there was one night I woke up at 4am and couldn’t sleep because I had this idea for a rotating spotlight light-fixture; so I got up and created this in Procreate in several hours. Although I illustrate almost exclusively in Photoshop, I’ve used Clip Studio Paint EX for lettering comics because it has useful tools designed for making that job so much easier. Otherwise, I haven’t really played with the program at all, even though I’ve been wanting to do so. While up late into the night (because I’m a night-owl and can’t seem to get on a normal schedule), I decided to launch the program and check out its brushes. And honestly, while I’ll still be using Photoshop for a while, I have to say that inking and painting in CSP is so much more fun and its brushes are so much nicer and natural that Photoshop. Here’s just a page of doodles done while playing with the program. Nothing fancy or “nice” because I was just enjoying getting a feel for the pen tool and brushes and wasn’t trying to create something to post. Another nice thing about CSP that I think is better than Photoshop are (as I already mentioned) the tools available for creating comic books, not to mention tools for simple frame-by-frame animating. And best of all, you can render in vector without the STUPID, counter-intuitive techniques required by Adobe Illustrator, a program I (and many other artists who came from traditional media) simply loath. As far as the many custom tools or blending options Photoshop offers for photo-editing which we artists utilize for illustrating, I don’t know how many such tools CSP has yet. Maybe not as many (for now). However, the advantages it has over Photoshop is still pretty impressive. So while I won’t be switching to this program just yet, I plan to learn it and keep it as a backup program when/if my OS X no longer supports CS6 (I haven’t updated my iMac OS in years because their updates tend to take things away or mess things up. Gone are the days when I was actually excited about an Apple OS update and was willing to pay for it. Now I don’t even want it for free). The thing is, I suspect that day will eventually come, and I refuse to allow Adobe to extort a monthly tribute from me rather than sell me a copy of Photoshop, so I’ll be looking for a new program to replace Photoshop CS6 for illustrating. At first, I thought Corel Painter would be my go-to replacement program if I had to leave Photoshop behind, but now I think CSP will most likely be the software I turn to. In fact, if I can find the time to learn it, I’d like to start using it for my professional work right now, or maybe bounce between CSP and Photoshop and use the best feature of both programs. So if you’re worried about what you’ll do when your Pre-CC copy of Photoshop is no longer supported and you want a software you can purchase and own, you may want to check out CSP. Incidentally, Clip Studio Paint has a mobile version for the iPad, but it’s a subscription-based app, which baffles me because the only reason I’m willing to use their desktop version is because I can buy it. Hopefully they don’t do something stupid and start requiring a monthly fee for their desktop version. If they do, I’ll dump them in a heartbeat and use Corel Painter. One of the tools that would have made things easier when I was working in traditional media (before completely digitizing my workflow with a Cintiq) is a good light-box, which would have allowed me to use any paper I like rather than relying on graphic paper or vellum to clean up my rough drawings. While I like graphic paper, it can be too thin for wet media, including ink when applied liberally with a brush. I’ve decided recently that I’d like to get back into using traditional media, if only for my own projects which have no deadline and don’t require the efficiency of a fully digital workflow (though I do plan on utilizing the Cintiq where it still makes sense to do so). This time around I’d like to use a light-box so I can work with a thicker paper, like bristol board or even watercolor paper. And then I realized I didn’t have to use old bulb technology, given the ubiquitous availability of LED lighting. Still, my lightbox would have turned out looking like the above design, minus the giant Edison bulb perched on top. That was till too clunky. And then I figured that if I thought of using LED technology for a light-box, and since many artists use the light from their iPad or other tablet as a light-box, then surely a company out there has started manufacturing LED light-boxes. After mentioning this to my lovely bride, she does a quick search and sends me a link for a light-box large enough for my desired use. And it’s flat to boot, which makes it perfect for laying on my drawing board without bulking things up. Well, it arrived yesterday, so here are a few pics I thought I’d share. I didn’t place anything next to it to give you the sense of its scale, but it’s “Yuuuge” and can accommodate something like professional comic art boards (I bought this on Amazon which advertised the size as 21 x 2 x 29.8 inches, though it looks a lot thinner than 2″. Heck, it doesn’t even look like it’s an inch thick). As you can see below, it sits nice and flat on the drawing board. The power button is one of those surface-flat, touch-sensitive power buttons on which you don’t even have to push. It’s pretty sensitive, because I’ve accidentally turned it on while reaching for the power cord near it. When it’s powered on or off, the light comes on and turns off very gradually. It’s not like flipping on a lamp. My wife made me a cover for my Cintiq so it doesn’t collect dust while not in use, and I asked if she’d make one for this as well. She immediately dug out some fabric and made a cover to keep this clean and neat. What an awesome wife — I’M NOT WORTHY! This thing is so flat and slim that it’s actually difficult to wrap the edges of the cover around it. That’s not a complaint. It’s actually nice that it lays so flat. So there’s the quick reveal. Since it just arrived, I didn’t have time or an opportunity to try it out or to take a picture showing it in use. Maybe I’ll get to that in a future post if/when I do an actual review of this. I do most of my professional work on a Cintiq these days. Even when I was still on a drawing board, I stuck with technical pencils to avoid all of the sharpening required with wood-cased pencils. Still, there’s a certain charm about using wood-cased pencils, so that’s what I often use when doodling chicken-scratches. Now, a pencil is a pencil is a pencil, and at the end of the day the quality of your drawing is going to come more from your mind and hands than from the pencil. Nevertheless, your frame of mind can be affected by the satisfaction of using a particular tool that inspires you or makes your job easier. 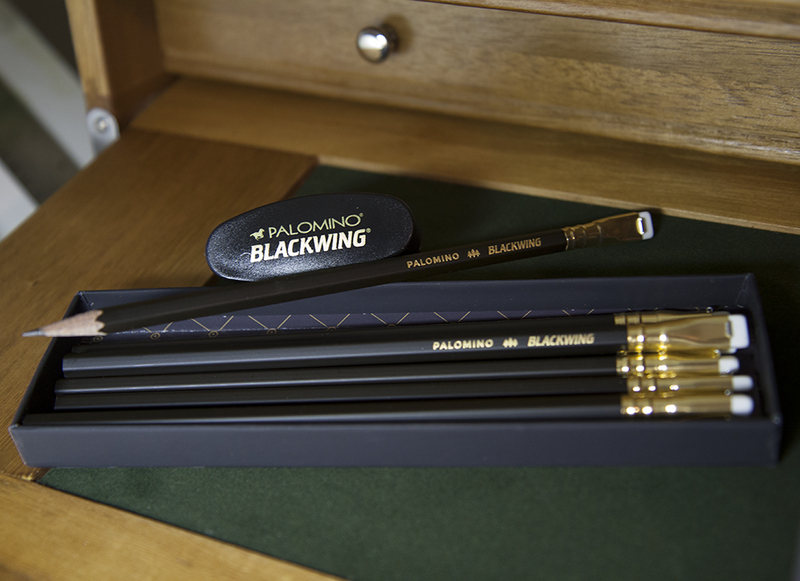 One pencil that has been given lots of attention because of its widespread use (especially by animators, writers, and composers) is the original Blackwing 602. Off hand, It’s a beautiful design if tool aesthetics is your thing, what with its unique ferrule design and replaceable eraser. I also picked up a two-step, long-point sharpener, since an electric sharpener eats up pencils and wastes too much lead. Lots of these type of hand-held sharpeners have cheap blades that break your lead or don’t really sharpen well, but the German-made blades on this work quite well, though I’m not sure where to purchase new replacement blades. These pencils come in a nicely designed box of twelve. I no longer go through pencils like I used to, so I gave one to each of my kids to try out as well since they do a lot of drawing. I didn’t have time to do a nice drawing with this pencil for the purpose of this post, but I wanted to show a comparison between a couple other good drawing pencils: the Schwan Stabilo 8008 and an old Faber Castell 9000 4B pencil made in Germay. All three of the following pencils are really smooth. The Stabilo 8008 is probably the smoothest, but it’s the lightest in tone as well, so if you want a darker lead, the other two are better. 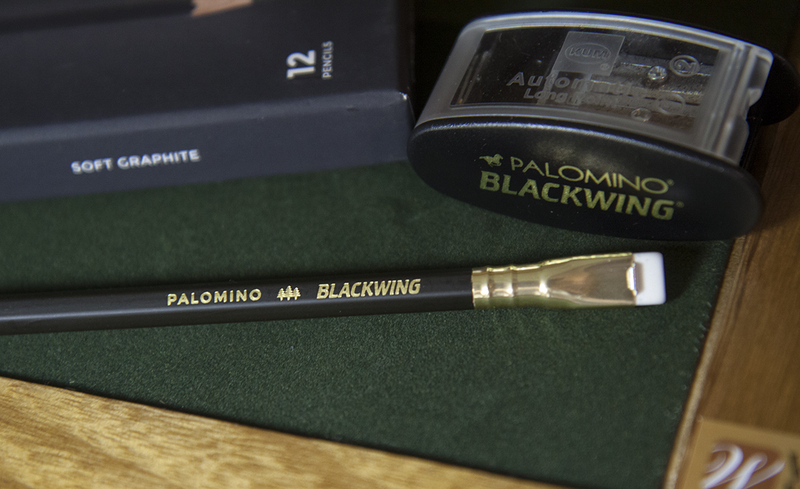 The nice thing about the Blackwing is that it’s both firm and dark (though this one is softer than the “new” 602). Usually, I find dark leads are too soft or grainy. Surprisingly, I found the Faber Castell 9000 which I had fumbling around my tool drawer to perform as well or better than the Blackwing. 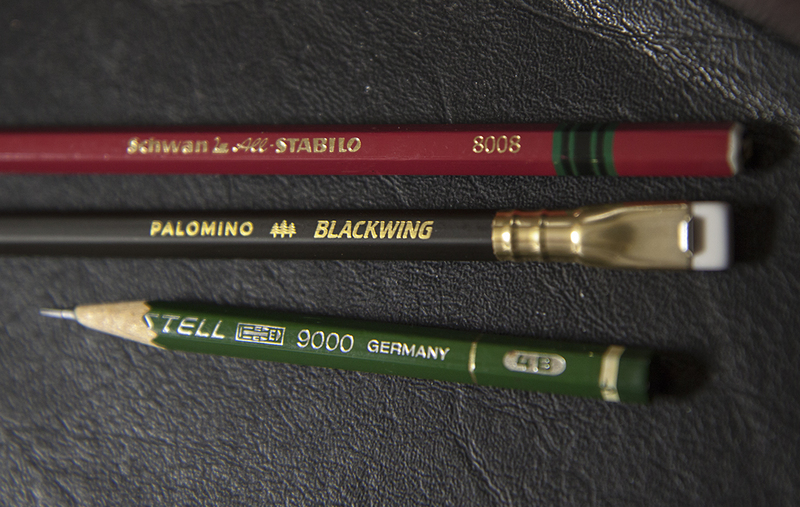 In fact, I liked it so much that I went online to try to find more of these older versions, but I could only find two, each for slightly more than what the new Blackwing costs. They’re still manufactured, but I never know whether to trust newer models because it seems everyone’s manufacturing is done so cheaply now in order to cut costs. I’m not suggesting the new Faber Castell 9000s under production are not good. I just don’t feel like spending the money to find out. In any case, if I ever come across more of these older 4B 9000s, I’m grabbing them as fast as I can. In the meantime, the Blackwing works quite well and offers lots of drawing satisfaction. I scrawled out a few swatches of each for comparison. I acquire a lot of art books. I mean, a LOT. Most of them serve as inspiration when I just feel like getting into a certain mood before tackling a project. Others provide ideas for color palettes, lighting, or anatomy reference for animals and people, and still others help with period costuming (unfortunately, I have no access to a theatre company’s costume or prop department, so I make due with period films or period artwork for reference). So my trek to the Comic Con is really to see what’s new in pop art and to hunt for new and inspiring art books (as I’ve stated elsewhere, Comic Con these days is less about comics and more about pop art, gaming, films, toys, with some comic stuff thrown in there to appease the die-hard comic fans). In the past I made a beeline to Bud Plant‘s booth, which was a great booth for art books. Unfortunately, Amazon has killed small book dealers and Bud Plant, after surviving going completely out of business, has been reduced to a small table in the back, near the food area. It’s really sad, because I’ve purchased some hard-to-find art books from them in the past. The other book-seller I make sure to peruse is Stuart NG, who seems to have a healthy business due to his plentiful offering of imported books (usually from France) which aren’t something you usually find on Amazon or in your average bookstore. And then I may purchase a sketchbook or something from the many artists who are there to show their stuff. The two books on top are children’s picture books in that unspeakable language, French. I’m a sucker for a charming children’s picture book. It doesn’t matter that I can’t read them, because I really only enjoy them for the art. The Dean Cornwell book is something I’ve wanted for years because I really admire his art. He’s simply a fantastic Golden Age illustrator. The books in this unforgivably blurry photo were all free. The top two are James Bama books which were given away by Flesk publications. I suspect they had quite an inventory they couldn’t move and it would be cheaper to get a tax write-off by giving them away than to let them collect dust in a warehouse. I already own a Bama book with his DocSavage illustrations. These two are more personal western art, art which is well done, but not really of much interest to me. Still, who am I to turn down free art books, right? The bottom left item is a Heritage Auction House catalog featuring a lot of Disney and other animation art for sale. Oh, and I didn’t shoot a pic of it, but in case you were wondering, I got DC’s The Flash pin with the Con bag (for those of you who know to what I refer). One of the backgrounds I created for the interactive iOS children’s book app, Cozmo’s Day Off, by Ayars Animation contained an alien city scene, with ships and rockets zipping about. As on all of the pages, there were many fun little interactive elements on this page for kids to discover. One of the interactive elements on page 8 is the ability to rub a couple of billboards which exposes different ads underneath. You can see below where they’re located on the page. Here are some of the silly billboard designs I created for this interactive feature. The really fun thing about producing this book app was the freedom I had to be as creative or goofy as I pleased. In fact, we had far more ideas for this book app than we could feasibly implement. Many a day I wake up at the crack of noon, get dressed (in something that covers my underwear), and walk to work (down the hall) to begin work by “warming up”. Waaaay back, over a decade past, around the time I created Cozmo, I had created a bunch of other characters that might inhabit Cozmo’s universe. There were robots, animal-like creatures, aliens in costume, and so forth. These were of a whimsical nature, because I had originally intended them for the giftware market, which, at the time, was saturated with “cute” characters. I’ll share more about Cozmo’s beginnings in later posts, but for now I thought I’d share one such character design. 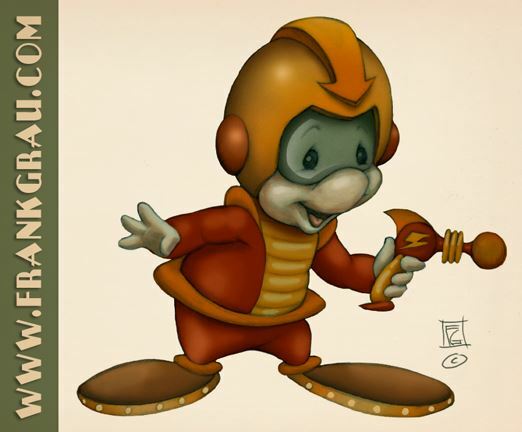 Like Cozmo, this character never saw production. Come to think of it, I never even got around to pitching it, because Cozmo never really ever got off the ground, and there didn’t seem to be any point in trying to pitch more of these characters. Jump forward to the 2011 Comic Con, where I met Kevin Freeman from Animation Rigs. Animation Rigs produces rigs for animation projects and for students who haven’t the time to model their own characters. Kevin had purchased the license to create a rig of this character. When they had completed modeling the character, they sent me the test video below to show me how it turned out. Here’s a character design I did for Animation Rigs. Be sure to follow us on , Twitter, and Instagram!